Why does the land warm faster? Don't ask a science denier! One thing a person will notice almost immediately upon entering a climate science denying blog is a distinct reluctance to read scientific papers. Oh sure, deniers will quote papers that haven't been published as long as they conflict with mainstream science (and sometimes contrarian papers that slipped through the net). Deniers have a tendency to come up with their own explanations for observations. That is, when they aren't protesting that those same observations "must be" wrong (and sometimes while they are protesting). Update: Almost a day has passed since Willis posted his questions. It took 93 comments and almost 18 hours before someone thought to check the science. Steven Mosher, in his sixth comment on the article finally thought about science and provided references to scientific papers on the subject. So far no-one, including the original poster, Willis E, who since made another comment, has taken the slightest bit of notice. Update 2: 24 hours later, Willis finally took some notice (still no-one else has) but said Steven's papers didn't answer his specific question. I think he's shifting the goal posts. (Despite using "models" to generate his charts and, as one denier puts it, his myriad "BS thought experiments", Willis gets in a dig at models.) He hasn't given any indication he is going to look elsewhere or any indication he is capable of relating the findings of the papers to his questions. If only he could overcome his phobia about models - the paper I refer to below is well-cited (32), easy to follow and quite explicit. Extended Reconstructed Sea Surface Temperature (ERSST.v3b), which is a reconstruction of sea surface temperatures available here. The latest reconstruction is described in this paper by Smith et al (2008). Hadley Centre Sea Ice and Sea Surface Temperature data set (HadISST) which is described here. A paper by Rayner et al (2003) can be downloaded here. The International Comprehensive Ocean-Atmosphere Data Set (ICOADS), which is described here. 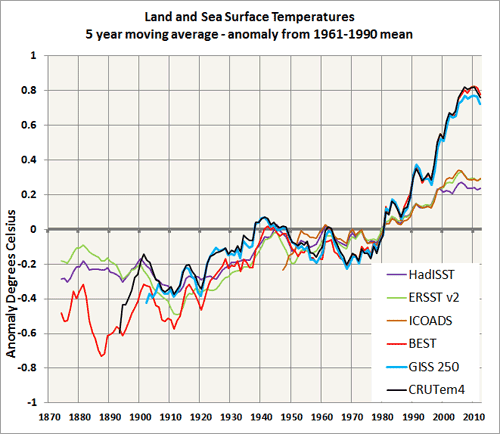 Willis plotted the above SST data sets with the land surface temperature data sets BEST, GISS 250 and CRUTEM4. You can read more about CRUTEM4 at SkepticalScience.com. Rather than put up Willis' chart I'll show my own. I'm not sure Willis used the same base anomaly for each data series and, in any case, he only shows data from around 1950. I've plotted the data as five year moving averages using the July to June annual data. You can see in the above chart that the land surface is warming considerably faster than the sea surface. Since 1979, land temperatures have increased about twice as fast as ocean temperatures (0.25 °C per decade against 0.13 °C per decade). Ocean temperatures increase more slowly than land temperatures because of the larger effective heat capacity of the oceans and because the ocean loses more heat by evaporation. In this paper, we separate the contributions to the enhanced warming over land from CO2 change and imposed SST change. Even without a change in CO2, the warming over land is greater than over sea when SST is raised (Joshi et al. 2008; Dommenget 2009), and our experiments show that the land–sea warming contrast in response to elevated CO2 is due mainly to this SST-forced contribution, with the SST forcing explaining 80% and 64% of the land warming signal in December and June, respectively. Land surface warming in response to imposed SST change is the warming over all land areas, whereas there is weak regional cooling in some land areas in response to CO2 change. With a rise in CO2 and no change in SST: Some land warming happens immediately when CO2 rises, because of increased downward longwave radiation, even with no rise in SST. Land warming is enhanced because plant stomatal resistance with higher CO2 results in less evaporation from land surfaces. This in turn means a rapid reduction in cloud amount so there is more downward shortwave radiation and therefore more surface warming. With an increase in sea surface temperature and no change in CO2, the warming of land takes place more slowly and the troposphere warms more evenly. From the abstract: "The warming is largest in the upper troposphere over both land and sea". There is more to it. The paper is well worth a read to find out more about how the temperature of the land surface responds to changes in CO2 and sea surface temperatures. 3. last but perhaps not least, the decline in solar activity. May 6, 2013 at 3:09 am ...I think the land and oceans are heating /cooling differently due to the same sort of effect, that is why the land has warmed faster since the 1970s, and I think its mostly due to the sun, which showed higher output in the late 20th century. Solomon Green thinks he has just discovered why it only seems to be warming: shifting anomalies! May 6, 2013 at 4:30 am I found Markx point fascinating. If the “mean global temperature” has been consistently reduced since 1988 then no wonder the anomalies so beloved to climatologists show continued global warming. Some of the commenters tried to reason Willis' puzzle. They came up with various charts and pictures, blogs and even some newspaper articles. However, not one of them (so far - update as of now 80 comments) ventured to see if a scientist could provide them with an explanation or checked the literature - nor even Wikipedia. To see more of Willis' Wonderings - click here or here or here or here or here. Yes, I thought it was pretty obvious that one wouldn't expect the sea surface temperature and the land temperature to rise at the same rate - for exactly the reasons you mention. Pity one can't point this out on WUWT without being accused of some horrendous crime against humanity. Actually, it's called "averaging" -- a term that is apparently too complicated for many WUWT'ers to wrap their little minds around. In fact, a basic temperature anomaly averaging program that produces results very similar to the NASA/NOAA/BEST/CRU land temperature results (and from *raw* data, BTW) will fit on a single page###! Last year, Kevin C. over at skepticalscience.com posted a simple global-average temperature program that he coded up in python. The program allows you to compare results from raw vs. homogenized data and rural vs. urban data. I modified it a bit to make it easier for folks to perform "apples vs. apples" comparisons of the program output with the annual-average results published by NASA/NOAA/CRU/BEST. I also added a bunch of comments that explain exactly how to use it. There's nothing fancy there -- just a python script that you run at the command line. The script output goes into a simple .csv (comma-separated values) file that can be plotted up with your favorite spreadsheet program. And if you strip out all the comments and print statements, the code really will fit on a single 8.5x11 page. Python, the language the program is written in, is one of the easiest languages for a beginning programmer to learn. Folks, the take home message here is: Someone with good programming/analysis skills can confirm the NASA/NOAA/BEST/CRU results quite easily. It just isn't that hard. And if you roll up your sleeves, take the time to learn some python basics (not terribly hard at all), and study the code/comments in the python script, the "mystery" behind computing global-average temperatures will be completely stripped away. Then, once you come to appreciate how straightforward and robust the basic procedure is, you can then form your own conclusions about the scientific/technical competence of the WUWT crowd. So far no-one, including the original poster, Willis E, who since made another irrelevant comment, has taken the slightest bit of notice. Nothing to do with the OP really, but I'm wondering why your BEST data has a 1-2 year offset from GISS and CRU? Yes, I noticed that too. I wonder if I inadvertently got the data over Jan-Dec instead of July-June, or misaligned the moving averages? It's most probably my error. Fixed. I made a mistake in copying cells. Point 1: "The wholesale removal...." -- this is the old "dropped stations" canard. That there are fewer stations currently reporting data than there are in the total GHCN historical data set should not be surprising. Not all stations report data in "real time". For "old school" stations, you have to physically transcribe the temperature readings from the station logs -- slow, time-consuming, and often an expensive proposition for thinly-funded research programs. So it should not be surprising to see a big time delay (many years) between the time that temperatures are recorded to the time that they actually make it into the GHCN data set. Therefore, it is inevitable that the most current data will come from a smaller set of stations than temperature data recorded, say, 30-40 years ago. So how do you evaluate the impact of that "dropped stations" problem on global temperature results? That's simple -- you simply add a few lines of code to your temperature processing software to identify stations that are still reporting data (a couple of do-loops) and use just those stations for your processing runs. Do that, and you will see that your results hardly change at all! It is left as an exercise to the reader to hack the above python script to do this (really -- it's just a few lines of new code). Now, folks, in all the years that Watts and Co have been bitching about temperature data, haven't any of them bothered to do anything like this? "Now, folks, in all the years that Watts and Co have been bitching about temperature data, *why* haven't any of them bothered to do anything like this?"